By Alistair Reign, May 19, 2018, Alistair Reign News Blog. Question: Describe your background in Yemen. For example, do you have family there? Where are you from? What were you doing before the war began? How old are you? 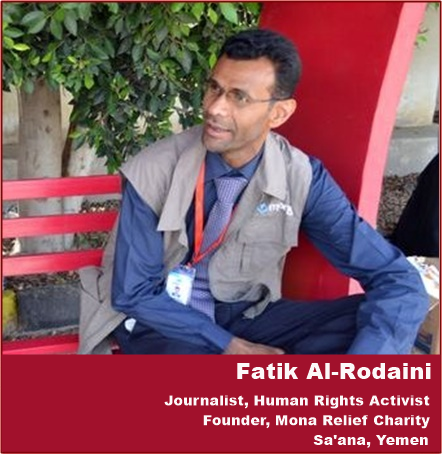 Answer: I am Fatik Abdullah al-Rodaini, a Yemeni Journalist and humanitarian worker based in Yemen’s capital of Sana’a. I am a 40-year father of six kids and a husband to a great wife that helps me on all my projects. I have a whole family in Sanaa, a mother, sisters and brothers as well. I have a BA degree in mass media from the mass media faculty, Sanaa University. 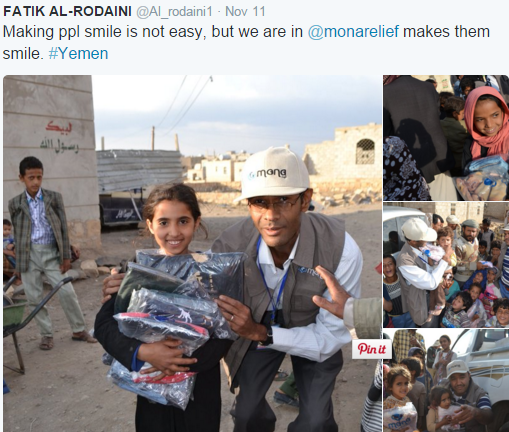 I am the founder and CEO of Yemen organization for Humanitarian Relief and Development (MONA Relief). The organization was established in May 2015 as a Sanaa-based Non-governmental organization. Before working as a humanitarian, I worked as a translator at the office of President Abd Rabbuh Mansour Hadi during 2014-2014. Prior to this job, I worked as the editor of the news website of late president Ali Abdullah Saleh at Yemen’s News Agency Saba during 2007-2012. I started to work with Saba in 1996. Question: How did you begin your relief efforts? Fatik: I started working as a humanitarian after the Saudi-led coalition launched a bombing campaign in Yemen in March 2015. I could not stay home or watching while my country was in need of all of us. When the humanitarian situation started to deteriorate because of ongoing war and blockade, I decided to do something to help affected people. My humanitarian work has been focused on saving lives of IDPs and most vulnerable people in Amanat Al-Asimah “Sanaa the capital”, Sanaa the governorate, Amran, Saada, Hodeida, Marib, Dhamar, Mahwit and Hajjah. Question: What do you do each day and week as part of MonaRelief? Where in Yemen do you work? Fatik: I am the CEO of MonaRelief and have two main tasks, the office task is focused on daily and weekly communications with donors, international and local aid agencies and people that come to my office and ask for help. I also attend meetings of the UN and international organizations to discuss the situation and coordinate activities in Yemen. Moreover, I network with local organizations and support individual aid initiatives. The field task: I am the leader of my field crews. I visit cities and areas to distribute and supervise the delivery of aid to the needy people. I also assess where, how, why and to whom aid must be given, besides supervising the performance of the field crews in order to guarantee everything is done in a good way. You can find more information about our work on our website monareliefye.org; our twitter account @monarelief or @monareliefye; Facebook page http://www.facebook.com/monareliefarbaic, and Flickr http://www.flickr.com/monareliefyemen. Question: What is your mission with MonaRelief? What other organizations do you work with? Fatik: My mission to help alleviate the humanitarian crisis and contribute to efforts aimed at serving my people. Question: Is there a story from your work that stays with you? Why? Fatik: Yes. The story of a mother and her eight blind sons and daughter who fled the unabated battles between the Saudi-backed forces and Houthi-Saleh forces in the Nihem district in the governorate of Sanaa. This mother and her blind kids fled to the capital where they had no supporter until our organization visited and started to help them. They traveled at night from a mountain to another until they arrived in the capital. The mother is the only supporter of her kids. The war was the worst nightmare to them. It destroyed their farm which they used to live on and the house they used to live in. The father is suffering from a mental illness. She is a great woman. She did not give up. Question: How has the blockade affected your work? Are the goods that make it through actually helping people living in Yemen? Fatik: The blockade has affected my work largely. It has been preventing my organization from receiving aid cargoes “mostly food, clothes and medicines” and financial aid sent by foreign donors. We have been unable to receive financial aid through our bank accounts because Yemen was sanctioned and money transfers into it suspended. 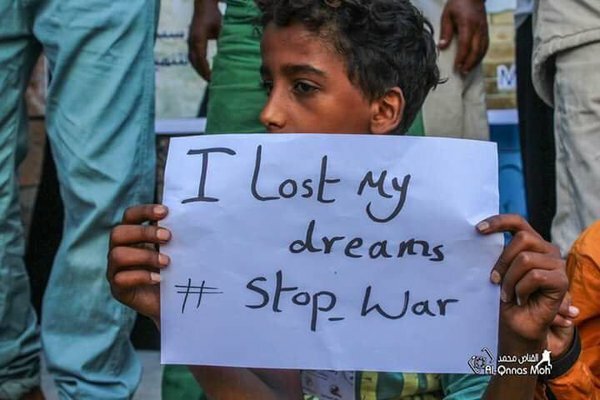 Question: What do you want people outside of Yemen to know about life on the ground there? What is the international community getting wrong about Yemen? 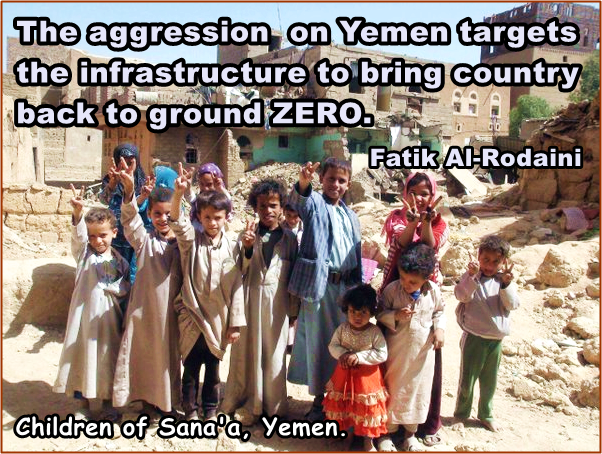 Fatik: In a few words, foreigners need to know that Yemen is facing the world’s largest humanitarian crisis and that all basic services are on the brink of total collapse. People in Yemen are dying from hunger and disease outbreaks while people outside Yemen either do not know about us or are just watching. Question: What can or should other countries do to help? Fatik: Other countries must do their best to end the war here. This is the first thing every one should think about. Then other countries should mobilize efforts to contain the humanitarian catastrophe and disease outbreaks. 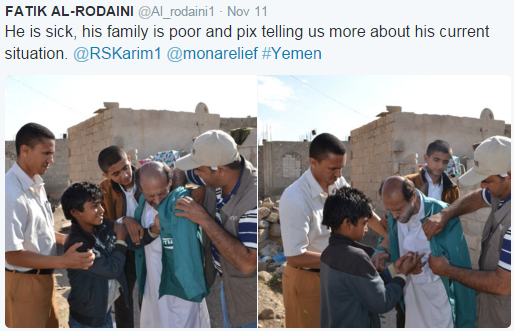 Well, media in foreign countries should write more about Yemen professionally. Question: You work in very difficult situations and with topics that are difficult, what keeps you motivated? Fatik: My country and people need me. I want to keep the smile on children’s faces. I want to save lives of those who have lost their supporters and hope. I can do something for the needy people and this is what keeps me motivated. Question: Where do you find hope? What does hope mean to you? Fatik: I find hope in providing more support to those who need it. At the moment, hope is everything.